How happy does this sink make you? Those knobs! That chrome! The minty goodness of it all! 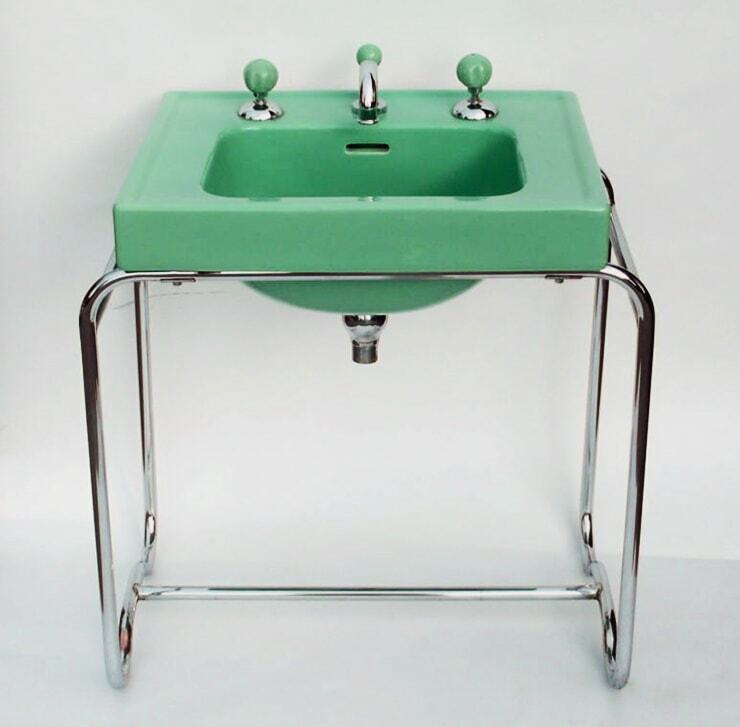 This beauty was designed by George Saiker for the American Radiator and Standard Sanitary Corporation (which would later join and eventually become what we now know as American Standard) in 1933. Man, what a beauty! It’s like a Breuer chair mated with a 1957 MG. 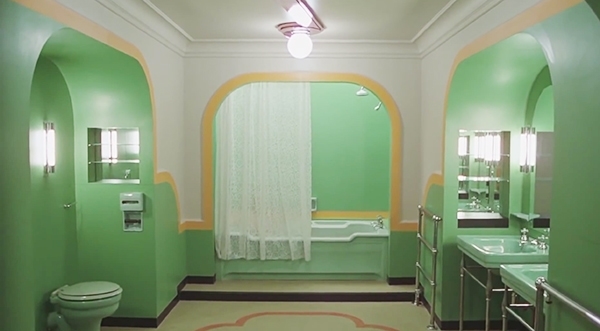 Between those brightly-colored sinks, the pink kitchens, and Wes Anderson’s confection of a cafe, I have really been feeling like I need lots of color in my life lately. Looking through my stash of bathroom photos, I’m surprised by how many of them are this certain shade of minty, sea-glassy green. It’s not a color I think of myself as gravitating to, but I guess I do! 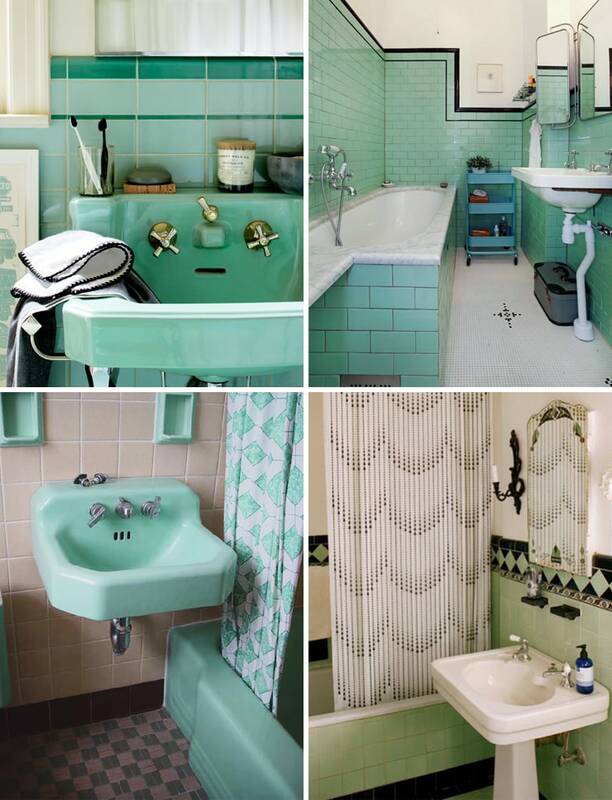 It’s funny, whenever I’m poking around looking for photos of vintage kitchens and bathrooms, the commentary on the ones I find on non-“designy” sites tend to run along the lines of “I CAN’T WAIT TO RIP THIS MINT GREEN ATROCITY OF SINK OFF OF THE WALL, HAHAHAHA,” and then of course on interiors blogs everyone is cooing about all of the original fixtures. I totally get not wanting to live in a time capsule, but I there are so many ways to update vintage bathrooms for better functionality and to feel more contemporary. Once those seafoam tiles are in the landfill, though, they’re gone. I’m pretty sure this sink and tub are old, and I’m totally sure the floor and walls are new. Now, that’s not the tile I’d choose for my own bathroom, but I think this looks really good. It’s bright and fresh and airy and all of the things that people worry about vintage bathrooms not being. Of course, you’d have to make sure your shampoo and conditioner bottles match the tub and sink, so I hope you like Prell. 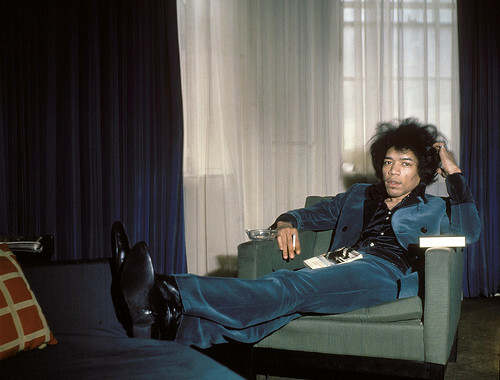 Jimi Hendrix: 40 years gone. I have a mint-green ceramic tub, just like the Tom Kirsch/Opacity pic…only it’s paired with white/gray marble floors (swoon!) 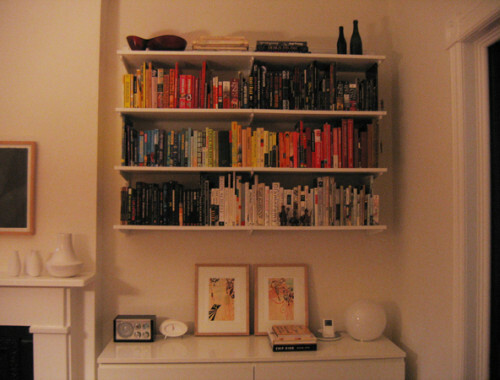 and LEMON YELLOW, BLACK, and ORANGE tile walls….It…it’s the worst and makes me want to stab my eyes out. I think I’ve figured out a way to refinish the tile without pulling it all out, but I cannot tell you how much I dream of white subway tile. Honestly, with the marble and the mint tub that could be a really great bathroom….just not with yellow/black/orange. Ahem. I’d definitely paint tile if I knew I were going to be ripping it out eventually, but I wouldn’t consider it as a long-term solution in a wet area. There’s too much potential for moisture getting trapped behind the paint and causing the grout to fail. 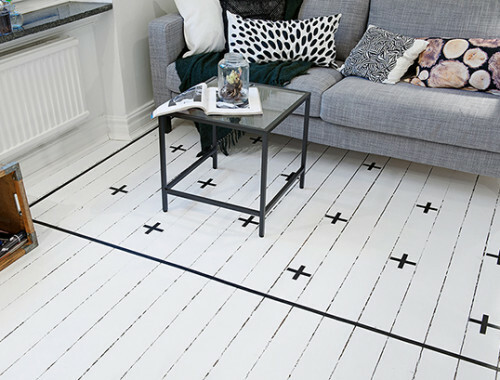 I’ve seen way too many mold-riddled stopgap “renovations” involving painted tile for me to be able to recommend it other than in completely dry areas. Oh yes! I truly love an OG bathroom–check out the sea foam on pink action in this place bathroom–with bonus minty kitchen: http://www.realtor.com/realestateandhomes-detail/2924-Iroquois-St_Detroit_MI_48214_M37618-14584. Never mind it’s more than 2x the size (and price) we’re looking for… Worth it maybe? Reba, I would LOVE to go to Detroit!! Reba, I’m just taking the time to click through this listing now. Holy mackerel! What a house. That kitchen!!! i love you so much for posting the 237 bathroom. !!! it’s like the house i ‘almost’ got. the bathroom had epic green tile! That looks GORGEOUS, Jacinta! I love it. 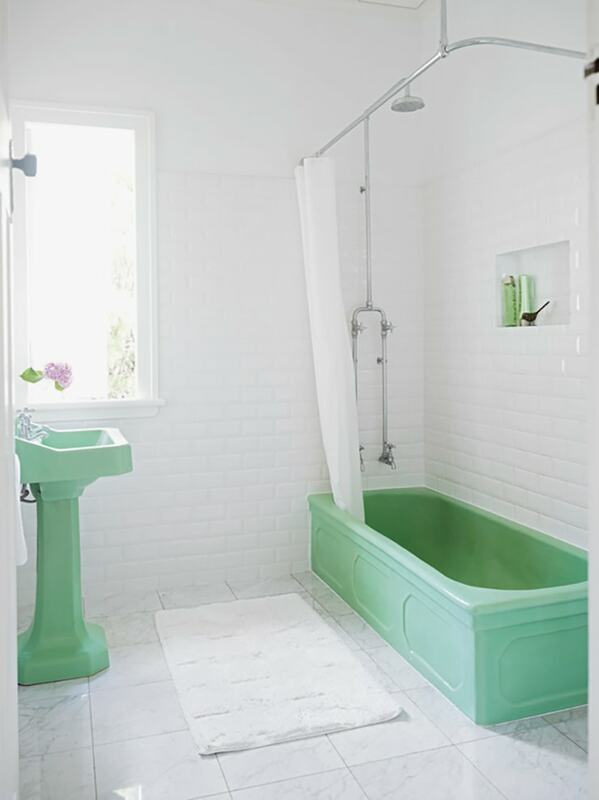 I love that white bathroom with the green sink and tub. Those tiles wouldn’t be my choice, either, but they go a long way towards making it look updated. Back in my “renovating a victorian Philadelphia townhouse” days, a British friend was visiting and commented that he had not seen that much L’eau de Nil since post-war Britain. What we call Mint Green I guess everyone else calls water of the Nile. I loved my Mint Green bathroom. I regret that I had to leave it behind before the renovation was over to start a new life in NYC. Now I have generic rental beige. oh well. oh thank you for room 237! that was my first thought when I saw your title. and the Prell comment……….. pretty hilarious! I’m working on an exhibition about how Alfred Barr and Phiip Johnson brought modernism to the US (in NYC in 2017; stay tuned), and that first image…that’s my life right now! You brought to mind a conversation that the team has been having–the idea that most people don’t think of the Bauhaus and early modernism as being as colorful as it was, because the photographs of the objects were all B/W until much later. Interesting, no? Oh, and I thought I’d miss all the home improvement posts, but this life curatorial conversation (for lack of a better term) that you’ve opened with your readers is so much fun! Thank you! This is really cool, Judi, thanks for sharing!! Lucie, wow! Your house!!! What a massive project that looks like, but you have an amazing place to work with. Good luck!!! Hmm, yes, nice…ohh, love that color…that’s interesting…..AHHH HORRORS! ANXIETY ATTACK! I’ll never forget that bathroom! I completely agree. I just renovated my 1936 bathroom. I started by removing ugly cream colored paint from my vintage blue- green tiles. I love the super saturated color every time I walk in my bathroom and I don think I’ll ever tire of it. My husband has always called this green “Harry Truman Green”. We’ve also met someone else who had always called it “Early Eisenhower”. It’s a fine point. Thanks Anna. I did find this entertaining and am ever hopeful that more colors will be named for various administrations. Back in the 70’s I had an office in an old psychiatric hospital (yes, they saved a room for me!) and the walls were mint green. Hated it until I realized that my black plastic square tables full of plants and my black rotary telephone were the perfect accents for that color. This is my bathroom! 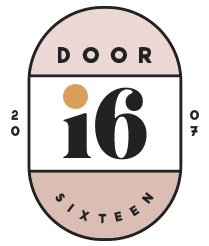 Very much the colour theme in The Shining – light yellow and mint green… the terazzo floor with a little red and black geometric detail. It is absolutely divine!